Mangosteen has what many people say is the most delicious flavor of all Thai fruits, it's extremely sweet and fragrant. It's been said that in the 19th century Queen Victoria loved it so much that she offered a knighthood to anyone who could bring edible mangosteen to England, but in those days long transit and spoilage prevented anyone from getting the prize. Now you can have it delivered to your door, premium quality, we are sure you'll enjoy it. Mangosteen is great served in a large bowl full of ice cubes. See mangosteen as part of our entertaining look at a Thai public market. Also found in trendy bars as a popular ingredient in various cocktails. Product of Thailand. On a seasonal basis, we offer fresh mangosteen. 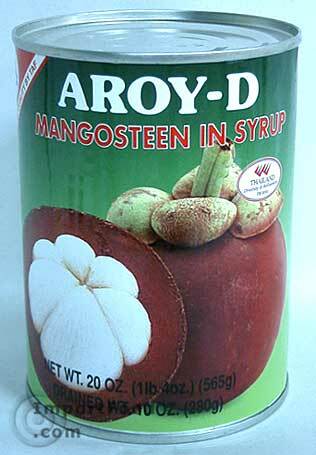 Ingredients: mangosteen (49.5%), water, sugar, citric acid.